Incase you missed it, just more than a month ago, my new book Ukulele Exercises For Dummies released in various places around the world. Ukulele Exercises For Dummies is a practice-based ukulele book that helps you improve your skills on the ukulele in many different styles including strumming, fingerpicking, soloing, learning the fretboard and much more. Learn more about the book and get a sample chapter here. If you picked up a copy of the book, thank you so much. I can’t express enough how grateful I am for your support. So far, the response has been very positive. I’ve been thrilled to hear how people are using the book to improve their ukulele skills. These are just a few reviews of many. To read more, visit the book page on Amazon.com. If you prefer to work with your local bookstore, give them a call and they will be sure to get it in stock for you. Thank you again for all of your support and telling your friends about my book. You rock! I am committed to making many more ukulele lessons and materials for you in the days and months ahead. How to you get registered to sign in with a username? Recently started to learn to play the Ukulele. Your tuition technique is first class. I am 70 and just joined a local Ukulele beginners band. It’s great fun and helps make learning more interesting. So I have the best of both worlds, great therapy for us older beginners. Struggling a little with chord change overs but determined to become a proficient player. This is great, Michael! Glad to hear you’re experiencing growth as a ukulele player and are able to play ukulele with other people. That’s the way to do it. I had no problem opening the lesson book. Try opening in chrome. Thanks for putting all the mp3 for download, Brett. I just bought the Kindle version of book when I saw that the mp3 can be downloaded. Hi Lea, to access the audio tracks on your iPad, download the tracks by chapter rather than by part. This will allow you to save the audio files or listen to them on your iPad. 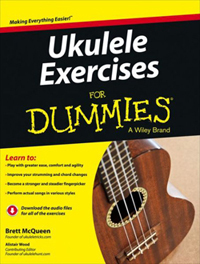 finally got to the point of needing more Uke exercises, so I downloaded your Ukulele Exercises for Dummies on my Kindle last night, and after looking it through, it is probably the best Uke exercise book oh the shelves-digital or not, for every uke player out there. thank you so much and thanks to amazon for making the Kindle version so easy to see the necessaries, i.e, charts, chords, tabs, etc…It’s a cool book that I will use for a very long time to come. Colleen, it’s great to hear from you. I’m so happy to hear that you’re enjoying Ukulele Exercises For Dummies! Thanks for the great review. Brett, I purchased Ukulele tricks video course over a year ago, but had put it down after about a month. I’m back in action and loving it. The fact that the purchase is lifetime really is a head above all of the rest. Sometimes schedules are hard. Because of that and the overall quality of all of your products, I had no problem purchasing your new Finger Picking tricks even though I’m not really ready for it yet. Knowing it will be there when I am is worth its weight in gold. I’m combining what I’m learning on your site with a local 8 week class and finding there is too much to practice all at once. I’m wondering if your “Ukulele Exercises For Dummies” will help me to better plan my practice sessions or just add more fuel and confusion to the fire? Dave, I’m thrilled you’re enjoying all the lessons! Sounds like you’re diving right in head first! I’d say finish up this 8-week class and then see where you’re at. Ukulele Exercises For Dummies is a great book to have to supplement what you’re learning in my courses or your class with additional exercises and practice examples. It’s an easy book to flip through. This is the book I bumped into that inspired me to pickup the uke for my daughter. It turns out that I’ve spent more time on the uke than she has lol, it’s really addicting. It’s like once you pickup the uke, it’s not as easy to put down. Congrats on the accomplishment of this book Brett. Jan, yes, you can purchase Ukulele Exercises For Dummies through the iBooks Store via your iPad. However, some customers have reported issues with reading some of music in the book via the iPad. For this reason, I ultimately recommend people purchase the physical copy of the book.